Discover for yourself why Warner Ranch in Tempe and Chandler Arizona is one of the most popular communities in the Phoenix metro area. If you like miles of tree-lined walking paths, swimming, lush parks and so much more, Warner Ranch might just be what you are looking for. Take a look at a few of these fine homes then contact us to schedule your private tour. 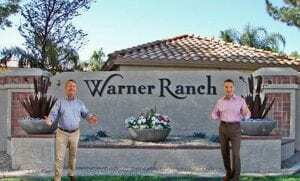 Warner Ranch homes don't last on the market for long so save this search and keep checking back for new listings. Fill out the form below if you have questions for us. Tom and Hal will be happy to help. The ARMLS logo indicates a property listed by a real estate brokerage other than EXP Realty.